Be on the look out peops, word on the street, those canine teeth will be flying in to town and infesting our second storey watering hole on All Hallows' Eve. As the dark sky closing in, spaces be filled with flowing velvety capes and piercing bloodshot eyes, and with Count Nicksterz as the night’s hypnotic ambience keeper he’ll make sure those pointy ears sharp throughout the night making you just wanna bite! 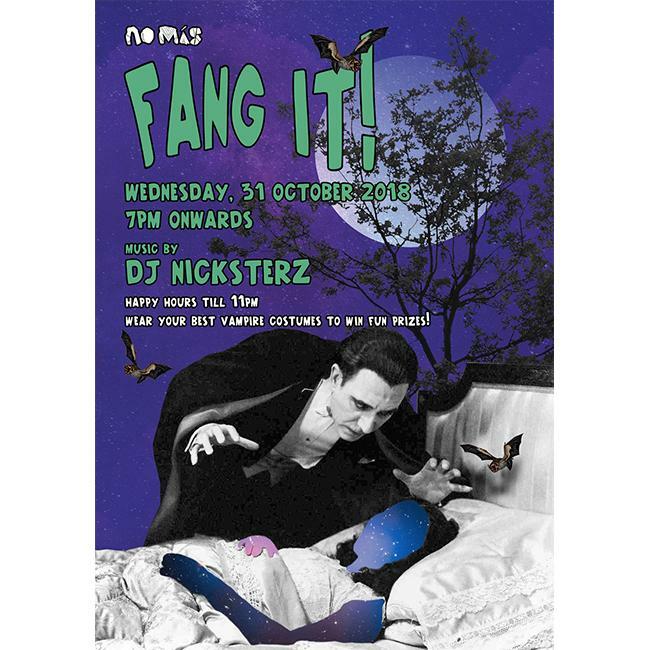 Come out join the fang crew with your finest vampire duds on and the crew shall pick two who nailing it (not to the heart) and score two towering tasty goblets. As the fang crew always say, be sure to never leave a neck hanging. Just fang it! Address: Jalan Monkey Forest, Ubud.